From Canton Custom Guitars comes the Mini Gordo Midi Guitar – a custom design for Stephen Barry. Performing much of his live and studio work with the Roland VG-99 V-Guitar Multi Effects Processor System and Roland GR-33 Guitar Synth, Stephen was looking for something different. 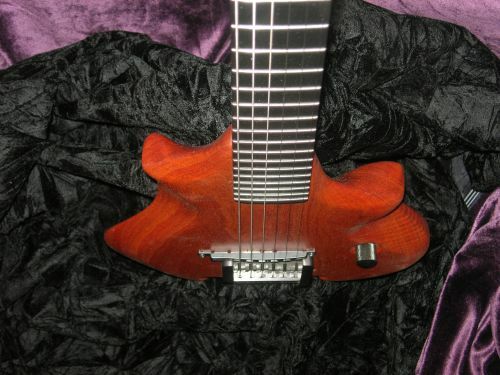 Stephen’s intention for this guitar was to have an elegant, sleek guitar while being simple yet powerful. He also wanted a travel friendly guitar due to his traveling schedule so this new model fit perfectly for him. Stephen aptly named it the Mini Gordo. And at a mere 4lbs 8oz, this compact instrument is just the thing for protecting your back on those long, late night gigs. 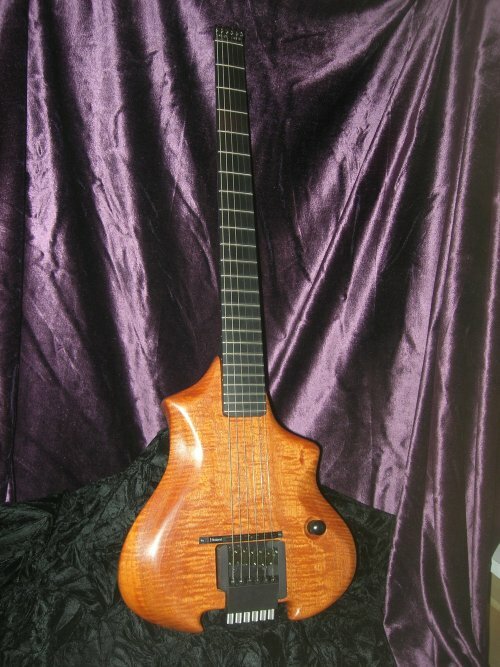 For more, check out the follow up article, Mini Gordo Guitar Revisited as well as the forum post Mini Gordo Midi Guitar in Action where you can listen to an original composition played on the midi instrument. very nice piece of gear indeed! Way cool, very very nice wood, woodwork. What’s the pot for, Vol control or something else? Agree, I am interested in the back of the thing. thanks for the reply! i understand the control layout now, it compliments the guitar. love the it!! Looks pretty cool. Can you give more details on the specs? In particular, I’d like to know about the dimensions (length and scale). I travel a lot and would love to get a custom short scale guitar. Thanks for the additional details on a wonderful instrument. Do you plan any demos? I’m looking forward to it Stephen! Greetings J P Brito, Rick offered to make the Mini Gordo using the Ghost system as it surely would have continued the Zen like theme I was looking for to a higher degree. I opted to use a Roland internal GK3 because I found it to work much better with Roland’s VG-99. There seems to be a general consensus about this on the Yahoo VG boards as well. In the end for me, function won out over form in this case.